Enjoy the ‘Spectacular’ Jumping Crocodile cruise on the Adelaide River. 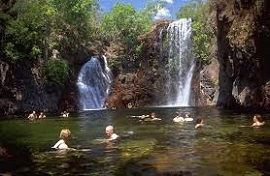 Continue onto Litchfield National Park, experiencing a myriad of diverse environments including rugged sandstone escarpments, perennial spring-fed streams, monsoon rainforest, magnetic termite mounds, waterfalls and historic ruins. Spend lunch and swim at Wangi Falls.